Main focus of the discussion: How to engage more meaningfully with the audiences of today and tomorrow. Overall assessment: The level of participation and debate clearly showed what is considered by some to be a new cultural revolution: audiences are hungry for engagement, for shared experiences, for a sense of community. There is thus a need to stimulate exchange of practice in this field, to support cultural organisations to learn faster by peer learning in order to adapt more quickly to the challenges and opportunities of the 21st century. Other key notes: Audience development is one of the priorities of the EU’s future funding programme for the cultural and creative sectors, “Creative Europe”, which will replace the current Culture programme in 2014. Engaging a broader public with cultural works is a priority for the European Commission. This is the reason why “audience development” is one of the priorities in the proposal for “Creative Europe”, the future EU funding programme for the cultural and creative sectors and why it was the theme of conference “European Audiences: 2020 and beyond” organised by the European Commission on 16-17 October 20121. Audience development is rapidly becoming more wide-spread, but some cultural organisations have already developed an engaged relationship and dialogue with their audiences for a long time. The conference offered inspiration, experiences and lessons learned from a range of European cultural projects with experience in this field, most of them funded through the EU Culture and MEDIA programmes. Over a day and a half, some 800 conference participants from across Europe and diverse cultural sectors explored the concept of audience development from various perspectives through 23 European cultural projects presented in the plenary and in an exhibition. The event focused on grassroots cultural operators, projects and practice. The conference gave an insight into the large amount of fascinating, informed and diverse work taking place across Europe. Projects were presented from a wide range of sectors: live performing arts including dance, opera and theatre; the visual arts; film; literature; multimedia; heritage and interdisciplinary projects. The examples included work performed in more traditional and formal settings such as museums, theatres, cinemas and festivals, as well as projects in unconventional settings including old people’s homes, schools, offices and some other very unusual public space such as farms or trolleybuses. The conference began with a discussion on what audience development is and why one should consider it as a core part of any organisation and event planning. It then explored how audiences could be empowered through involving them upstream in programming, how audiences can be engaged by sharing the experience in dialogue or actively in the process, how audiences can be further expanded and diversified, and challenges for cultural institutions in terms of hosting and managing the audience and their expectations. It is not an easy task to summarize the richness of the presentations and the engaged debates during the conference. The aim of these conclusions is to seek to capture some of the main elements which emerged as perceived by the Commission. These conclusions have no formal status. 1. Audience development – what is it? Audience development is a strategic and interactive process of making the arts widely accessible by cultural organisations. It aims at engaging individuals and communities in fully experiencing, enjoying, participating in and valuing the arts. Its focus is on a two way exchange. The appropriateness of the term “audience development” was discussed in order to frame the subsequent discussions in the conference. It was generally considered to be a more holistic term than, for example, concepts such as “cultural education”, “arts marketing” or “cultural inclusion”. “Access to culture” is a more rights based concept, while cultural education implies the implication of schools and linkage with educational curricula. Arts marketing and cultural inclusion are both more mono-dimensional focusing on either economic or social aspects. In contrast, audience development integrates cultural, economic and social dimensions and refers to a space in which cultural organisations can act directly. Whilst distinct, it is however closely related to these other concepts. For example, the recently published report of a Member State expert group on Access to Culture2, confirms that audience development by cultural institutions, through long-term strategies, is an essential contributor to making access to culture a reality. Opinions on terminology in this field are unlikely to ever be totally unanimous. Audience development is nevertheless a term that is widely understood by the sector. diversifying audiences – attracting people with a different socio-demographic profile to the current audience, including non-audiences, those with no previous contact with the arts. Whilst some cultural institutions may work on all these dimensions, others may focus on one or the other depending on their circumstances and strategic priorities. 2. Why engage in audience development and why now? The debate on audience development is not new. The arts community has always been an engaged part of society, serving as an engaged critic of the world around it, dealing with problematic issues, questioning our comfort zones and reflecting on values and solutions. The will to engage in this dialogue has existed for a long time, but today audience development is increasingly a necessity, if broader access to culture – a common priority for culture ministries across Europe as expressed in various Council conclusions – is to become a reality. It is a necessity because the world is changing rapidly. The digital shift, more educated populations, greater competition for leisure time, demographic change including declining and ageing audiences for some art forms, and the squeeze on public funding means that most cultural organisations face a more uncertain future than in the past. They cannot afford to stand still – there is immense pressure to innovate and adapt. Organisations need to develop their audiences and diversify their revenue streams, in some cases literally as a matter of survival, in others due to the priorities of public funders. Organisations need to develop their audiences and diversify their revenue streams, in some cases literally as a matter of survival, in others due to the priorities of public funders. Furthermore, a paradigm shift is occurring. In the past, cultural institutions were created to increase and reflect national pride and to share the dominant cultural values, and in practice acted as mediators between the artist and the audience, as gate-keepers to what the public would and could access or see. Now we are moving to a more multi-dimensional and interactive world, due largely to technology which is changing the way we create, distribute, access and monetise cultural content, offering the potential to transform audiences from passive receivers into creators and/or active users of cultural content without needing to pass through intermediaries. It is empowering the audience in ways never seen before, and phenomena such as social media are contributing to this paradigm shift by changing people’s behaviour and expectations. Nowadays people want greater interaction and dialogue in all walks of life, and they are no longer willing to be passive spectators anymore when it comes to the arts. There is an increasing hunger for dialogue, debate and interaction. In addition to the need in many cases to engage in audience development, it is also desirable in itself. As well as bringing enjoyment, inspiration and personal fulfilment, cultural participation brings benefits to individuals’ creativity, something which is increasingly essential in a knowledge based society and has spill-overs for other spheres of life, including people’s working lives even if they are not employed in the cultural sector. For disadvantaged children and young people, it can help them re-connect to schooling and society. It was also argued, with reference to the work of the late Dragan Klaic, that there is a direct connection between active audiences and active citizenship, with research indicating that cultural participation increases the likelihood of broader civic engagement, including voting in political elections. The arts give people the opportunity to express themselves, it gives them a voice to tell their stories and culture plays an essential role in any democracy, taking the political debate from the political sphere and giving it back to citizens, with cultural organisations thereby providing a space for politics, debate and reform. People are today hungry for social engagement and connecting in communities. This is why social media and phenomena such as crowd funding which create a sense of community and foster loyalty have become so successful. From the European Commission’s perspective, audience development brings cultural, social and economic benefits. Cultural benefits in that it helps cultural works and artists to reach larger audiences, which has an intrinsic value in itself, and exposes more people to the educational benefits of the arts. It brings economic benefits as new and increased audiences can mean new revenue streams. Finally, audience development brings social benefits as artworks convey meanings and values, they give insights into other peoples’ lives and realities thereby broadening our horizons, fostering empathy, mutual understanding and intercultural dialogue. So by helping to reach the excluded, it contributes to social inclusion and people’s engagement in society. Audience development can take place at all stages of the artistic value chain: upstream (programming, creation, production) and downstream through dialogue with the artists and producers after the event. The next section of these conclusions will look at how audiences are even becoming involved “mid-stream”, in the artistic process itself. Regarding upstream involvement, in a general sense, new audiences cannot be gained by “selling them old experiences in new packages”. There must be some serious re-thinking examining who actually currently is your audience, why others are not your audience and who do you want to attract, as well as what is engaging and relevant for them, involving them in programming by re-inventing the repertory in collaboration with them to find narratives and produce works that are relevant to their lives and social reality. The Zuidplein Theatre3 in a deprived area in Rotterdam in the Netherlands explained how it was trying to ensure it connected with its contemporary reality and local community. They contend that “the customer (the audience) is always right”, not in a commercial sense, but in a social sense, in their need to debate through the arts on the topics that concern them directly. To survive, the theatre had to reinvent itself as the “people’s” theatre, embedded in its community and serving the city’s large population of people with low incomes and limited education, whether of Dutch or foreign origin. The theatre is a pioneering venture in incorporating the growing diversity of its population in programming, marketing, financing and staffing. The social dimension is paramount. The theatre has succeeded in re-inventing itself and audience numbers are up, but it admitted that it is a continual process to remain relevant. The future is still challenging and there is no room for complacency, but the theatre was optimistic and prepared to embrace the uncertainties and opportunities ahead of it. Empowering audiences through upstream participation is a long term process which is valuable in itself. The context, the journey that artists, cultural organisations and audiences undertake together is the most important element. It helps audiences overcome an initial fear of the unknown (which is at the same time fascinating), to remove the weight of (selfimposed) expectations, embracing surprise and stimulating engagement. Engaging in a dialogue with audiences from the very beginning of the creative process, co-creation, developing direct relations, where artists engage with the audiences to get their inspiration, is also beneficial to artists, enabling them to remain in contact with the reality of their time, and making sure their creativity remains relevant today. Audience development may be something that should be systematically incorporated into artists’ training. The question of engaging audiences in programming repertoire triggered some fears about the potential “dumbing down” of the artistic process. This issue needs serious consideration, but many considered that the real danger of dumbing down actually arises when cultural organisations under-estimate and patronise the tastes of the public or when they pander to mainstream channels. Properly carried out audience development in relation to involving audiences in programming requires careful reflection and preparation and asking the right questions is critical in this process. The example was given of a Swedish theatre which had undertaken some audience research and asked first what they “wanted” to see performed, and then what plays had “moved” them most in the recent past, with dramatically different and telling answers, demonstrating that audiences do not always know what they want until they are presented with it. Intelligent questioning and research, followed by careful interpretation of this information is crucial. The London Bubble Theatre Company demonstrated how involving audiences in the creative process and maintaining quality could go hand in hand. The theatre crowd sources creativity in developing its plays, including co-creation with local communities. Audiences could vote on the choice of show and be involved in its development and the first play developed in this way was a huge success. The theatre retained the right to take the final artistic decisions, but it opened up to the participation of audiences at all stages. This model has the potential for generating engagement and an active and sympathetic audience and thereby also potential for crowd-funding. The debate about “dumbing down” is present also in the film sector, where there are sometimes misconceptions about “audience design”. The term means choosing among the existing threads imagined by the film director to create interest from future audiences with the help of social media, without changing content or the creative process itself. Experience shows that audience design supports independent productions to get niche audiences, therefore it supports artistic integrity and quality. For example, emerging film-makers at TorinoFilmLab involve audience designers from the script development stage; they start building a community of support, for example on Facebook, while the film is being made. This does not mean that films are made on demand or that artistic quality is at risk, but that engagement and a true and open dialogue is created from a very early stage. Another fundamental part of the visitor’s chain is downstream engagement, in other words engaging in dialogue with audiences after a cultural experience, either virtually through social media or through physical opportunities to connect audiences with the artists and producers. New technologies and social media are introducing new ways for cultural organisations (and any organisation in society in general) to communicate and network with their audiences and communities. This places cultural organisations in the middle of the conversation, and not in the position of unique intermediary as in the past. Tools are already in place and being used in the cultural world. A cultural organisation cannot expect to be credible if it does not react to this reality. New technologies and social media are introducing new ways for cultural organisations (and any organisation in society in general) to communicate and network with their audiences and communities. The Rec>ON project designs theatre projects with a strong emphasis on workshops and debates with the audience on the theme of reconciliation and an audience with close experience of conflict. Modul-dance runs community dance programmes led by professional choreographers, ranging from family sessions for children, to customised work with particular groups such as older people, communities at risk of exclusion, people with disabilities. The audience is brought close to the creative process with possibilities for feedback and presentations, there are talks before and after the shows, and promotions with the theme “Don’t be afraid of dance”. There are even dinners between dancers and local people. Other speakers gave original ideas on how to engage directly with an audience during the visitor’s chain: give rather than seek attention; use volunteers and ambassadors representative of the community you want to engage with; engage audiences with art without them realising it is art as such and that they are the audience; create events that people remember, because they feel they own them; create events that take people by surprise in their regular life and disrupt their daily routines; work creatively with partners; create ownership even before getting in contact with it, “get their hands dirty”. The conference also confirmed that it is important to gather information not only about “who is coming”, but equally important to understand “who is NOT coming and why”, and to put this into perspective when deciding on audience goals. This leads on to another important challenge, namely the urgency of reaching the non-audiences of today, breaking down the obstacles which prevent them from meaningful cultural participation. Available data suggests that almost 60 per cent of the public across Europe never attend live performances or visit cultural heritage sites, and in most countries, well below 20 per cent of the population actively engage in artistic activities. Surveys also suggest that there is still a strong correlation between cultural participation and higher education levels4. Indeed, some participants indicated (and this is confirmed by research) that policies lowering the barriers to access in cultural institutions, such as offering free access, have had little impact on non-audiences, essentially attracting students, or the relatively highly educated who would have attended the exhibitions/performances anyway. To reach the real non-audiences, it was clear from the projects that cultural institutions or operators must move outside their walls – physically and mentally – into the community, into public space, unconventional venues, creating innovative experiences, and developing partnerships with other sectors, such as schools, hospitals, local authorities, supermarkets, etc. A considerable number of the projects were taking place outside traditional cultural venues, including some very unusual public space. This kind of art was also free of charge, removing both financial and physical barriers to access, and is not burdened by the public’s interpretation of cultural institutions as not for them. The Exchange Radical Moments! Live Art Festival surprises people, creating spontaneous interventions in public space, presenting them with “radical moments” so that in some events the audiences did not even know they were part of an art project. The Artichoke Trust takes giant mechanical elephants and spiders into the streets of cities, or stages light shows drawing big crowds and the crowds become part of the spectacle. The Kaunas Biennial TEXTILE’ 11 festival undertook a collaboration with industry, turning the workers in a factory into the audience during six months, with the experience encouraging them to think about their daily work in a different way. Sanctuary takes art into nature, industrial wastelands, the countryside, villages and small towns, taking art closer to people’s lives outside of traditional cultural venues and centres. Similarly, and arguing that “art is international and audiences are local” the Four CORNERS of Europe project took expeditions of artists into small towns, not typical cultural centres, in the outer regions of Europe, creating animations in unconventional places, encountering new audiences and introducing their realities to artists who all too often are isolated from the citizens they target. Fostering long-term cultural participation among non-audiences and even potential audiences is most effective when the audience moves away from being a passive spectator to being an active participant in the creative process or cultural experience. Totally removing the physical barriers to access by presenting work in public space is an important first step, but not always sufficient in itself. Whilst impressive works in public space may attract hundreds of thousands of people, and it is clear that the experience moves and unites people, often organisations do not know what happens afterwards to those who experienced the event. The very nature of work in public space, where visitor data cannot be controlled and counted, means that it is not easy for the impact of these kinds of works to be evaluated. 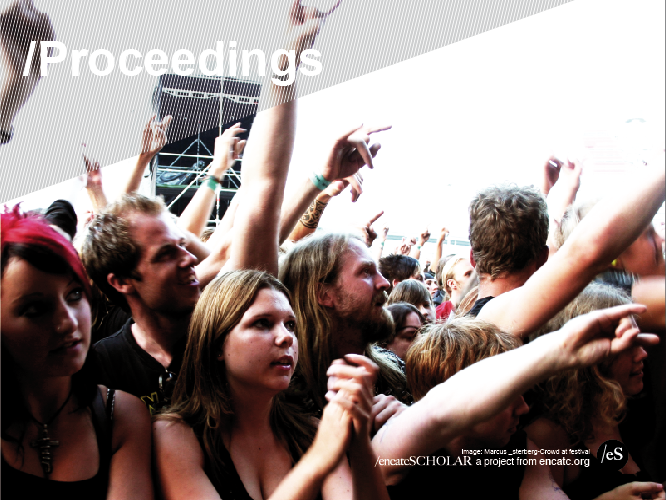 However, what does emerge clearly from the projects and a growing body of research is that fostering long-term cultural participation among non-audiences and even potential audiences is most effective when the audience moves away from being a passive spectator to being an active participant in the creative process or cultural experience. Indeed, the projects presented at the conference confirmed the growing phenomenon of participatory art, which recognises that artworks become alive first when a visitor sees, experiences and interacts, and is therefore the most empowering. The encounter between the audience and the artists can be considered as a magical, radical moment that creates art in itself and can change our perspective on life. New affordable technology, which reduces production costs in some fields, new platforms offering opportunities to selfpublish from literature, through to music, film and videos, are further offering exciting new possibilities for more people to become “creators” and active “users” of cultural content. The projects showed examples of very hands-on activities. In the “Opera J” project it was explained that “years ago, Italians used to sing opera at home – they don’t anymore and a rich tradition is at risk”. The project commissioned an opera specifically for children and provides for their involvement. Similarly tackling the challenge of ageing audiences in theatre, in “Young Europe 2”, the theatre repertoire is designed for young people and co-written by them. People were involved in puppet-making in the Flut and iKEDI projects. Robots and Avatars included workshops for children exploring art and technology in combination. Europa Cinemas, also in response to ageing audiences, gives subsidies to cinemas partly on whether they do some youth development work through a variety of different means – schools, universities, youth events, family workshops – as long as it gets young people into the cinema. An intergenerational project, Fotorally Euro Slam, linked secondary school students with senior citizens in retirement homes to compile a photography exhibition, with both generations learning different things from each other. All of these kind of projects can help to draw in the participants’ families and friends to the final performances or exhibitions, as well as stimulating their own awareness of the arts. Other projects in the conference were targeting key professionals, such as Audiences Europe Network, which is a platform for debate, exploration of ideas, linking culture professionals across countries and sectors. Similarly, Theatron brings together a dozen theatres across Europe to tackle the challenge of ageing audiences for theatre, whilst Reseo, dealing with similar problems, brings together the education departments of European opera houses and helps create training programmes to help teachers to work with children and adolescents in and out of schools. So what are the implications for cultural organisations? Technological change will continue at a fast pace and the sector will need to keep up with it, the competition for how people spend their leisure time and how they spend their income will continue to be intense. There will be changes in how people wish to access cultural works. All these developments have significant implications for cultural operators who must transform themselves. On the other hand there are immense opportunities for cultural institutions which are there to be seized. The cultural participation statistics mentioned above demonstrate the scope for considerable growth in participation rates with all the cultural, social and economic benefits this can bring. Cultural institutions should be seeking to embed themselves in their local communities, becoming welcoming and stimulating places where local residents want to return and spend time, which in turn will encourage them to become more actively engaged citizens. This local loyalty can translate into international success. Technology offers many opportunities. Institutions that could in the past only give physical access to a limited number of people can now potentially reach millions of people across the globe. Organisations are still experimenting with this new technology, for example, how to use web-streaming (eg concerts, live performance) and how to use technology to enhance the cultural experience, for example using technology to present cultural works in new, educational ways (eg works in museums). Some of these developments require experimentation by the sector, as sometimes incorporating new technology, such as web-streaming or developing Apps entails certain investment costs, raising the question of whether they can actually generate revenue or whether they will essentially have value as promotional and branding tools, as appetisers to tempt people to witness the real experience, be it a concert, a theatre performance or a museum exhibition. It is clear that there is no “one-size-fits-all” approach. Solutions will vary from country to country, city to city and institution to institution and probably even project by project for any given institution. Experimentation is likely to be a permanent feature. Developing new audience development techniques, engaging in new repertory development methods, new production processes and new spaces, and making the most of new technology requires cultural institutions to re-think the skills they need, addressing questions such as do they retrain existing staff, do they recruit new staff or work in strategic partnerships with other sectors, such as ICT, retail, media and publishing, or a combination of approaches. Indeed, inter-disciplinary strategic partnerships and collaboration with other institutions either in the same sector or across sectors are likely to be an important feature in the future. We can expect to see more and more local museums, bookstores, libraries, performing arts venues, etc, developing joined up projects, collaborating rather than competing with each other. Equally, artistic disciplines will mingle, so performing arts will be brought into new venues such as museums, bookstores, libraries, shopping malls, whilst performing arts venues will rethink how they use their static space and how they improve the visitor experience and optimise the use of their buildings over longer periods of times, such as staging exhibitions, debates, etc. These new trends have implications for cultural infrastructure and future investments. Organisations will have to look at whether their physical infrastructure creates welcoming conditions. Theatres and venues that separate the audience from the performance need to be re-thought. The buildings of the future need to be carefully designed to be more multi-functional, to be used for different purposes all day long, and to be able to adapt the spaces to audiences of different sizes and needs, and to permit interactivity between the artists and audience. Opening the book explained how they had taken inspiration from the world of retailing, with libraries transforming their relationship with audiences, including through rethinking their furniture and displays, as well as the staff becoming more pro-active in stimulating readers. Similarly, the Ashmolean Museum in Oxford, the oldest museum in Britain, explained how its major refurbishment in 2009 enabled it to profoundly transform its display strategies and to introduce new approaches to education activities and audience development. Visitor numbers tripled and the museum has increased its income. In an ideal world, even primarily non cultural infrastructure, from redesigned city centres to new railway stations, could also be designed to provide accommodating public space for cultural performances (as in future train station in Mons). More and more organisations are engaging in audience development and it can be expected to become an essential and unavoidable part of their activities. However the conference and the preparation for it shows that often organisations are undertaking audience development rather intuitively, raising the question of whether they could benefit from having more explicit strategies, which allow the entire value and visitor’s chain to be more joined up. In other words, rather than carrying out activities in isolation, to think through how they can link up and build on each other. For example, how an activity presented in cultural space which first draws in non-audiences can then be linked to other activities seeking to engage them in activities where they are involved as participants in the artistic process; or keeping up a community of followers engaged right from the programming stage through to production and performance/exhibition. Audience development should be embedded strategically and operationally, with clear goals and target audiences. Research and evaluation of success and failure will be another important part to see whether the strategy worked and what needs adaptation. It is clear that audience development involves the whole organisation, not only the marketing or education departments, and should not be viewed as an (potentially expendable) add-on. It needs to be integrated across all work areas and feedback from all users and staff should be equally treated. Top down approaches should be avoided. Audience development, particularly if done more professionally, does naturally have resource implications for cultural institutions from both an artistic perspective, to putting in place the technological infrastructure necessary today and acquiring the skills this requires. This may be challenging and require some reprioritisation in financial priorities. The value of data collection and interpretation to fine-tune products and works and target new audiences intelligently is also a horizontal theme. Learning from other sectors about marketing strategy and tools, does not mean compromising on the cultural sector’s role to provide meaningful experiences, expressing ideas and engaging people in a meaningful dialogue with reality. Audience development has already come a long way, and excellent practices exist across Europe, but they are geographically fragmented, and some countries are more advanced than others. There is however still a long way to go and the sector needs to adapt fast. The conference confirmed the added value of exchange of practice with peers from other countries, and the surprising amount that can also be learnt from other sectors, including between profit-making sectors and non-profit-making cultural sectors, and equally from non-cultural sectors. Some new trends are common to a variety of economic and cultural sectors, such as the emergence of subscription based models and other loyalty schemes, building on effective branding. The conference showed the degree of change that is taking place in the arts and the need for adaptation: everything and everyone is in flux. No organisation can afford to sit still. Change is likely to be a permanent reality that the sector needs to contend with and embrace, to see and benefit from the opportunities that the world today offers. Linked to this, audience development is not a final destination but an on-going process. Technology will continue to impact art creation, dissemination, distribution and engagement with the public. Revenue streams will continue to evolve, in parallel with audience tastes and what they perceive as relevant to their lives. Public funding is and will continue to be unpredictable. There will be fewer certainties in the future. Cultural organisations will have to stay on their toes. Each project may require a different approach – flexibility and open-mindedness will be crucial. It will be challenging, but also fascinating if cultural operators see the opportunity for this to be an enriching two-way process between audiences and artists, as well as empowering the public to become more active citizens. The conference showed that the cultural eco-system needs both established institutions, with all their assets, including buildings and collections, and new ones. Arts and culture needs to be found on street corners, in the middle of squares, in shopping malls, as well as in beautiful theatres, museums, cinemas, libraries and so forth. We need art in big cities, the traditional cultural centres, as well as in small towns and villages. Cutting-edge, provoking and disturbing art, as well as art that gives pleasure, enjoyment and fun, all have value, as long as they engage and inspire people, audiences and the public. Audiences in big numbers and smaller groups are of equal importance as long as there is meaningful encounter. We have greater knowledge, theoretical and practical, about audience development than ever before. Excellent practices exist in Europe but the knowledge is patchy and fragmented. European exchange of practice – with the Commission supporting the cultural sector – can bring real added value. This can help the sector adjust more quickly through peer learning, fostering accelerated learning through sharing experience, rather than struggling unilaterally with the challenges ahead. This confirmed the added value of including audience development as a priority in the EU’s future funding programme, “Creative Europe”. In the past, EU programmes focused mainly on supporting the “supply” side, fostering artist mobility and the circulation of works, with less attention paid to the “demand” side. Times have now changed and in the same way that the sector must adapt, so too support programmes must adapt and be relevant for the challenges of the 21st century. “Creative Europe” therefore introduces audience development as an important new priority and expects projects involving artist mobility and the circulation of works to build in the audience dimension. This could have a tremendous systemic effect on the sector across Europe and speed up the pace at which cultural institutions across Europe integrate this into their thinking and practices. Similarly audience development is highlighted as a priority in the Communication on Promoting cultural and creative sectors for growth and jobs in the EU adopted in September 2012, which calls for holistic approaches to supporting the cultural and creative sectors and multi-layered strategies involving the EU, Member States and other territorial levels5. In this context, Member States may develop their respective policies building on the recommendations resulting from the exchange of practices on “access to culture” and “intercultural dialogue”. The conference confirmed that this new emphasis on audience development could be the beginning of a great cultural movement and civic participation that starts with audiences, not in closed rooms. “The new role of arts managers should be to create reputable experiences and to invite people to a journey together” and “something is going on in Europe … do you feel the new wind blowing?” concluded Mary McCarthy and Chris Torch respectively, the conference moderators. People are hungry for social engagement and connecting in communities. Cultural organisations and audiences should move forward confidently together, and these conversations with audiences will ensure the long-term sustainability of the cultural sector.